Iowa is hog heaven, literally. More pigs live in Iowa than people, by six to one. 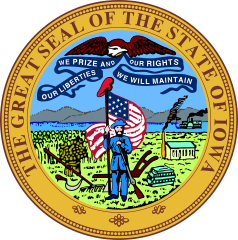 And with its winning combination of plentiful rainfall and fertile soil, Iowa is one of the richest farming areas in the world. Not only does it produce more hogs than anywhere else in the U.S., but Iowa is also the nation’s leading producer of corn, soybeans, and eggs. 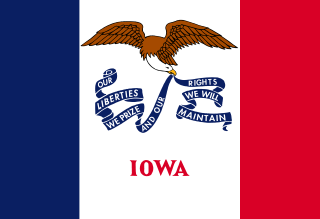 Iowa is bordered by Illinois, Wisconsin, Minnesota, Missouri, South Dakota, and Nebraska. The state is mostly flat grassland prairie. Its winters are cold and snowy; summers are warm and humid. Eastern Woodland Indians built huge soil mounds in northeastern Iowa from 500 B.C. to 1300 A.D. These mounds can still be seen today. Many of them are shaped like animals and birds. The Amana Colonies, a communal religious society established by German immigrants in 1846, still exists today. Grant Wood’s famous painting “American Gothic” was painted in front of a farmhouse in Eldon, Iowa. This famous house is still there. Question: How is the corn grown in Iowa used? Answer: Some of the corn is eaten fresh. Some of it is processed into foods like cereal, cornmeal, and corn syrup. But most of the corn grown in Iowa is fed to livestock or turned into ethanol, a non-fossil fuel source of energy. Watch a video about Iowa. Declan, Tobin. " All Iowa Facts for Kids ." Easy Science for Kids, Apr 2019. Web. 25 Apr 2019. < https://easyscienceforkids.com/iowa/ >.